Imagine a child who just “can’t sit down,” is “always running around” and rarely sits when asked. The usual routine is to point the powerful parent finger at the seat (or at the kid) and say more firmly, “SIT DOWN” as if he did not hear you the first time because you were not loud enough. Sometimes, when things go really wrong, one of two things happen: 1) we give up and say something ridiculous like, “OK, then you can’t watch your Buzz Lightyear goes to the North Pole episode” or something even more ridiculous like, “TIME OUT! !” or 2) we get so emphatic with our words that the kid sadly slumps into the seat and pouts. Neither is good. This is a lesson not simply in teaching kids to sit down, but to do other things they are not likely to do. Many times we try to teach these behaviors when they naturally occur: sitting at church, staying in bed at nighttime, using a “quiet voice” at the library, saying nice words when at Grandma’s doorstep. You get the point? Think about it…do we teach baseball players to hit only when the bases are loaded and there are two outs? This is obviously not the optimal time to teach hitting. 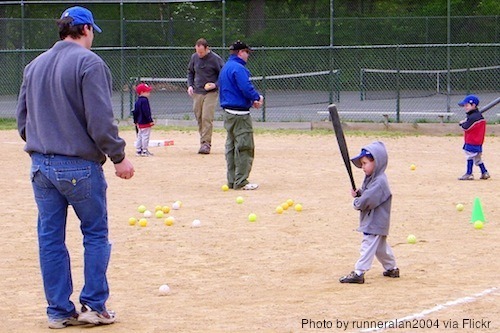 So what does “batting practice” look like for your kid? Back to sitting still. There have been multiple times when we have introduced the “sitting game” to families and teachers. The game is simple: sit for some period of time and you get praised and you get to get up. Pull a chair over in front of you and introduce the “game” to the kid. Count quietly for several seconds (maybe have a timer that beeps, but don’t show them the timer), and when the time is up say, “Times up! You did it! Go play!” Let her play for a minute (I would actually do less than 30 seconds or so). Play with her…make this really fun.Extend the time, make up new “rules.” Remember: it is a game! Repeat. Change it up…do some increments shorter and some longer. Make sure success happens. Don’t interact with them during the sitting time…the game is to sit! The objective here is to teach a behavior at a time when the focus can be on rewarding the behavior, making it fun and creating some momentum. Next time when real sitting happens, the kid will have had a lot of practice behind them with a lot of positive experiences. This entry was posted in Uncategorized and tagged Practice, prevention, reinforcement, teaching by BehaviorBandAid. Bookmark the permalink.